Step-by-step instructions on how to create a Page in WS.WebTV. • Version used for the screen captures: WS.WebTV Professional 3.0.1 (all extensions enabled). Some options/features might be different, respect your WebTV, depending on the installed version and extensions you have purchased. (A) To create a Page click on "New..." button and select "Text/HTML (Page)". (B) To edit an existing Page click the corresponding "pencil" icon. The creation and edition interfaces are very similar, however, the editing interface contains additional tabs, options and information. • Title: Enter a descriptive Page title, as short as possible. The title will be used on the menus. • Tags/Keywords: Write some representative keywords for your Page (comma-separated). If you are using recent versions of Chrome/Safari, Firefox or Opera, you can drag and drop your image file to the image field. • Menu Inclusion: Select the menu(s) where this Page can be included. • Template: Select one among the avilable templates for the Page (if any). 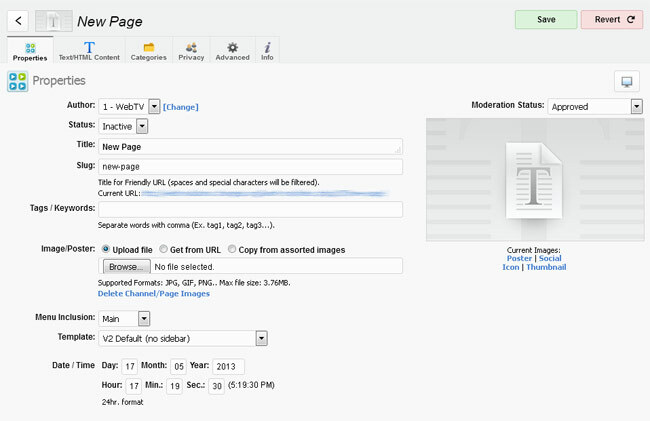 WS.WebTV can handle multiple templates for Pages. On this tab is where you enter the desired information. 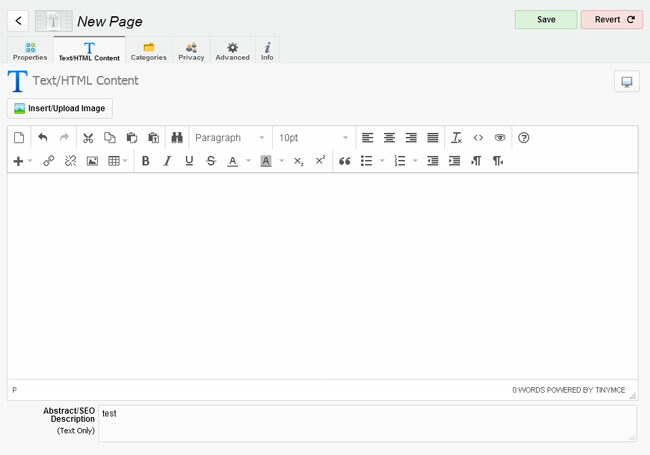 As you can see, we have included the popular TinyMCE editor that allows you to apply format to your content, easily. • Abstract/SEO Description: This description will be used for SEO and as excerpt when listing the Page on search result pages. Once you are done editing the Page, click the Save button. New Pages are inactive by default. In order to activate the Page, return to the Channels & Pages list and click the "gray light bulb" icon (it will turn to yellow when active).